How are the turks being treated in the Kingdom of Netherlands? Certain Azerbaijani and Turkish media write so much lies, false things and fantasies about the Kingdom of Netherlands that it makes one cry. Dear readers, I consider it my duty to bring to your attention some truths about the Netherlands. Let Azerbaijani and Turkish media, calling themselves “national”, while in fact they’re just “insensitive”, continue publishing their lies. For the past 27 years my family and I live in Europe. I have close friends – they are people of different ethnicities. I never denied my Azerbaijani origin. It’s impossible. You don’t choose your ethnic origin the same way as you don’t choose your parents. This is fate. But the duty of every human is to love and respect other parents and nations on a par with his. I have worked in many European cities. In addition to the worthy sons of Azerbaijan, I have worked with friendly Europeans of various nationalities. Thanks to my European friends, I was able to carry out my projects. We were able to bring the whole truth about Azerbaijan and, in particular, about Karabakh, to all the peoples of Europe. No matter where in Europe there was an argument about Azerbaijan, we always took part in it. But I’d like to note that if the nations of Europe would not have treated us warmly, we would not be able to conduct our activities. Because for Europeans the human factor is a priority. Dear readers! This is the factor that the treatment of all my compatriots living in Europe by local citizens as well as European states is based on. In Europe, the Kingdom of the Netherlands is one of the countries conducting the most correct state policy, and maybe it is even in the first place in that respect. Even if we look at the history of the Middle Ages and afterwards, we can see that the Netherlands always welcomed scholars and artists persecuted for their conservative views, from France, Austria, Italy, Germany, Poland, Czech Republic, England, Spain, Hungary, Sweden, and allowed to massively publish their works. To date, in the Netherlands, with a population of 16.5 million people, more than 3,000 nations, peoples and ethnic groups from 180 countries live peacefully side by side. All nations’ and peoples’ right to freely maintain their culture and religion is recognized. To this end, the Dutch government even allocates money from the state budget for all the cultural activities. In the Kingdom of the Netherlands, the Turks have always been the second most numerous nation after the Dutch. However, over the past 15 years, the second largest place was taken by the Poles. Although the Turks are in third place, they play a significant role in the economy. In the Netherlands there is no hostile policy towards any ethnic group, in particular to the Turks. For many years the mayor of Amsterdam was a Jew, and the mayor of Rotterdam – an Arab from Morocco. At one time, Secretary of State of the Netherlands was a Turkish woman. The law enforcement agencies of this country work have representatives of various ethnic groups. Among the police officers, by ethnicity, Turks are in second place after the Dutch. In the Netherlands there are no less mosques than döner shops. But, unfortunately, there is no normal academic turk-related library. Although there are hundreds of bookstores and libraries with religious literature, run by Turks. Turkish Cultural Centers, where Ataturk ideas are continued, gradually disappear. Also, cities of Holland open Turkish religious schools, religious hostels, and boarding schools for Islamic religion studies. In the Netherlands, there are more than 450 thousand Anatolian Turks. However, according to the number of students enrolled in universities in the Netherlands, Turks are behind all national minorities. Even arubians, who are a total of 50 thousand people and citizens of the Netherlands, are ahead of the Anatolian Turks by the number of college students. The reason for this is probably known to imams of mosques, co-operative and privately owned ones, the number of which is growing rapidly. In the capital city of Holland, Amsterdam, there is a street, a park and a statue of the founder of the Turkish Republic, the great leader Mustafa Kemal Ataturk. The Dutch people are especially sympathetic to Ataturk. I have to tell you about a bitter reality. At all the religious gatherings of Turks in the Netherlands, the founder of the Turkish Republic Mustafa Kemal Ataturk is being constantly insulted. Even protesting against that has become impossible. But with all the responsibility I declare that the Dutch, out of all ethnic groups of that country, trust Turks the most, they have no phobia in that respect. Therefore, dear readers, do not believe the lies and libel on Holland and the Dutch people, printed in Turkish press. No enemy has brought so much damage to diplomatic success of Turkey which took years to build, as well as to its growing position in the world and the country’s image, as did the rulership of the Justice and Development Party (AKP) and its undisputed leader Recep Tayyip Erdoğan. To date, the AKP and Erdogan policy has practically left Turkey without any friends. In the Netherlands they like the Turks, because Turkish people are hard-working and honor the laws. But they’re misled by excessive religiosity and supporters of the AKP and Erdogan. Over the past 15 years, that faith has started after the coming of AKP to power in Turkey, and now it encompasses all Turks living in Europe. As the main instruments of the AKP power is head covering, increasing the number of mosques and growing religious prejudices, it means that our Turkish compatriots living in exile prefer to be AKP supporters because of their ignorance and illiteracy. Because in their homeland in Turkey they still have families left. And AKP has been sermoning them for 15 years about the “bright future”. Since the Netherlands demonstrates tolerance for all religions, it does not prohibit the shops with religious literature or persecutes for it. There is a real cause of conflict in recent years between the Netherlands with the AKP. This is due to the amended article 78 of the Electoral Code of the Republic of Turkey, the changes that were made in 2008 on the initiative of the AKP. In the appendix to this article, the paragraph openly states: “During the election or referendum, the officially registered in Turkey political parties and structures can not conduct propaganda among the citizens working outside Turkey.” It is this law that helped prevent attempts of those representing the power of the AKP ministers, officials and committed structures, conduct propaganda for the referendum in the Netherlands, Germany and other European countries. The AKP authorities and Erdogan believe that they can continue anywhere in the world their illegal acts committed in Turkey. Which is why Europe, particularly the Netherlands, said stop to the AKP! That followed from the laws of the Netherlands. Rather than learn from it, the AKP and its leader Erdogan, challenging the world, started another scam within the country, and achieved limitless possibilities for the president on the referendum, which was held on April 16th. Although the majority of the 6 million Turks living in Europe voted in a referendum against it, but the changes were still made in favor of Erdogan. In fact, Europe has made it clear to Turkey: “Read your constitution and electoral laws.” Moreover, it was a very subtle message. But the AKP, as always, instead of correcting the errors, just criticizes Europe, particularly the Netherlands, just as it does with Fatullah Gulen. Cynically exploiting patriotism and love to one’s country, they are deceiving millions of people and indirectly threaten them. 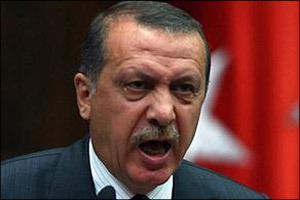 Erdogan skillfully uses faith and national feelings of the Turkish people. To date, the intellectuals in Turkey are subject to serious discrimination. These are the bitter results of the AKP and Erdogan’s government.